Quantitative analysis of multiple sclerosis patients’ preferences for drug treatment: a best-worst scaling study. Lynd LD, Traboulsee A, Marra CA, Mittmann N, Evans C, Li KH, Carter M, Hategekimana C.Ther Adv Neurol Disord. 2016 Jul;9(4):287-96. doi: 10.1177/1756285616648060. Epub 2016 May 15. Lynd LD, Traboulsee A, Marra CA, Mittmann N, Evans C, Li KH, Carter M, Hategekimana C.Quantitative analysis of multiple sclerosis patients’ preferences for drug treatment: a best-worst scaling study. Ther Adv Neurol Disord. 2016;9(4):287-96. OBJECTIVES:The objective of this study was to elicit patients’ preferences for different attributes of MS drug therapy. 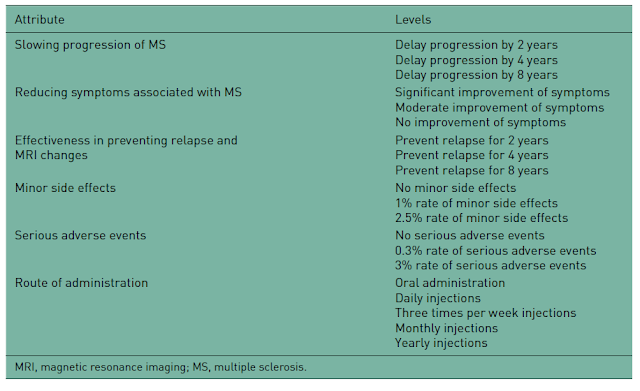 METHODS: A representative sample of patients with MS across Canada (n=189) participated in a best-worst scaling study to quantify preferences for different attributes of MS drug therapy, including delaying progression, improving symptoms, preventing relapse, minor side effects, rare but serious adverse events (SAEs), and route of administration. RESULTS: Analysis revealed heterogeneity of preferences across respondents, with preferences differing across five classes. The most important attributes of drug therapy were the avoidance of SAEs for three classes and the improvement of symptoms for two other classes. Only a smaller group of patients demonstrated a specific preference for avoiding SAEs, and route of administration. CONCLUSION: This study shows that preferences for drug therapy among patients with MS are different, some of which can be explained by experiences with their disease and treatment. These findings can help to inform the focus of interactions that healthcare practitioners have with patients with MS, as well as further drug development. What this study says is depending on the drug will influence why you choose it. It appears that one selects the more effective drugs based on their efficacy and the less efficacious drugs based on their side effect. Should this define how we develop drugs? I don’t think we should developing drugs that don’t work very well we have enough of them already, we should aim for agents that work. However, risk aversion appears to play an important part and so it is understandable that people want drugs that work but drugs that have as low a side effect as possible. However when you are using a sledge hammer to crack a nut as we are now doing, these two desires are poles apart. If the immune system is the problem and you smash it , it means you can’t fight infections etc. The only way to get the high efficacy with the low side effect profile if MS is an autoimmune system, is to develop antigen-specific therapy. Should you hold your breath for this? No it is not coming soon. There are only phase II studies in progress and in my opinion some of these are not going to make it. I was at a meeting recently and a load of people said to me that, they think the only way it will work if the mechanism is by bystander suppression. The idea is that the regulatory cell produces an inhibitory cytokine response to suppress other immune cells in the local environment. Yes I buy the idea, but the reality so far has been universal failure. Also if you suppress other unrelated immune responses in an environment then why would this not suppress your responsiveness to an immune response against an infection in the brain? However, I really wonder if these antigen-specific therapies actually work in the CNS or do they actually work by suppressing the immune response in the peripheral circulation? If this is the case directing the suppressing cells to myelin basic protein to supress and immune response against myelin oligodendrocyte glycoprotein or proteolipid protein as you may do in bystander suppression, may be irrelevant if the target for suppression is say within the lymph glands, what will secreting IL-10 there do? As I had not been offered an MRI during the 3 years of taking a DMD, and new symptoms are brushed aside, I stopped taking it. During the first month several symptoms that were impacting me daily ceased and I feel so much better. I am loath to approach the hospital and ask for something else, not least because I don't want to feel pain and exhaustion every day. I would rather get on with my life and be able to enjoy my teenage children and be there for them while they are still at home. And I can't see that the DMD's do much for progression anyway, so why spoil my time now? Relapses come and go but those awful side effects were constant. Whilst I understand your comments please maintainhealth.org. you have cognitive reserve and this can be eaten away without noticing it until your threshold is reached. Re: "And I can't see that the DMD's do much for progression anyway, so why spoil my time now? Relapses come and go but those awful side effects were constant." The evidence shows quite the opposite; DMDs to have an impact on progression. If someone can't tolerate drug x then there are alternatives DMDs available. Thank you for your response. The first 2 relapses were mis-diagnosed as strokes, it has been rough, sometimes it feels safer to keep your head down and do nothing. I couldn't find maintainhealth.org, I had a look as the second relapse came with significant cognitive issues which have improved mostly but has left it's mark. I am not sure if it is the 'done thing' but I may write to some other hospitals near me to see if they do annual MRI's, I may feel better about tolerable side effects if I know the drug is doing some good. http://www.msbrainhealth.org give a copy to your neurologist. My last 2 neuro appointments were with a locum – the same one – I imagine her hands are tied by the hospital's policies/budget? However I will send a copy to the neurology dept when I inform them of my med change. Thank you for the link, sounds wonderful, my own experience is a million miles from these recommendations so I for one would be extremely pleased to see any of them implemented. I have a PhD and have published several papers in JI and other immunology journals. So, when I was diagnosed, I asked for the most effective treatments available. My symptoms are relatively mild, ON and some mild sensory things. But I want to keep them mild and not develop new and irrecoverable disability. My options were given as Tecfidera, or Rebif, and my backups were copaxone or aubagio. On follow up about 8mo later, when I said that rebif made me feel like death 5 out of 7 days a week, I was offered copaxone or aubagio, and no more tecfidera. Alemtuzimab, Natalizamub, and Fingolomid were reserved for non-responders for the others, and particularly aggressive forms of MS. The reason the more effective options weren't tabled: Safety concerns. What bothers me about this analysis is that it assumes that I am incompetent to assess my own risk/benefit profile. I found it very patronizing and frustrating. This is a field ripe for disruption, I'd go straight to vendor if I could. Re: "What bothers me about this analysis is that it assumes that I am incompetent to assess my own risk/benefit profile. I found it very patronizing and frustrating. This is a field ripe for disruption, I'd go straight to vendor if I could." We couldn't agree more. One of the objectives of the blog is to empower with you with enough knowledge to challenge patronising HCPs. In the modern world patient involvement in decision making should be the rule. Perhaps you could try seeing a different neurologist. He or she doesn't really sound competent and seems ignorant. I have seem many doctors since my MS diagnosis and in my opinion the knowledgeable ones are more confident, they respect and listen to their patients, and work with them as a team. The others treat me like I am a stupid person and boss around. We saw seven and settled on one until we found one that knew how to listen. One of the seven was brilliant but in another state lol. Have 2 more that we are waiting for appointments lol. One of the two the MS society described as being "on the [autistic] spectrum". The anecdotal reports I've heard of him from patients who are friends were very positive – far from being on the spectrum, he seems by the reports, to be eloquent and a thinker. I already have it clear in my mind that if I can I will use the Clasribina. A friend of me perguntouriscos "on hematological risks and thrombocytopenia" with Cladribine, I said I know them and I assume, because that drug for MS, in fact which medicine has no side effects? When used Rebif for 3 months I thought I was going to die, a remedy that at least for me seemed to be a 30% positive and 70% of side effects, then put it in my mind "what comes after Rebif is gain"… I already have it clear in my mind that if I can I will use the Clasribina. A friend of me perguntouriscos "on hematological risks and thrombocytopenia" with Cladribine, I said I know them and I assume, because that drug for MS, in fact which medicine has no side effects? When used Rebif for 3 months I thought I was going to die, a remedy that at least for me seemed to be a 30% positive and 70% of side effects, then put it in my mind "what comes after Rebif is gain" … another thing I was wondering, can I even be talking nonsense but creating immune tolerance to the problem may be in the thymus? In cells still inserted therein, or infected by EBV? Another thing that I Just was wondering: can I even be talking nonsense but creating immune tolerance to the problem may be in the Thymus? In cells still inserted therein, or infected by EBV? It seems those pwMS that shout the loudest get heard. There are pwMS that have mild MS symptoms, are pushing for Alemtuzimab and are getting it. and yet i know at least of two patients who are shouting loud and getting doors shut in their faces. What do patients do about this Prof G? I've started studying human rights and healthcare, not sure how much it can help for this type of situation but good to know. "DMDs do have an impact on progression"
If you take them early enough – not when you've had a primary progressive course for 16 years as I have. Perhaps I could wish for Ocrelizumab to become available in the next years in the UK. Then perhaps I would be able to take this drug. And perhaps – perhaps – my progression would be slowed to some extent over a 10 year period until I am ~50. Then the increased risk of cancer could take me down – lights out, game over. No thanks, I'll take the other road, even if it leads into a deap, dark bog. At least it will be a bog of my own making. I agree with Sunshine's comment. I have what could be described as "mild MS" but shouted from the rooftops for Lemtrada. It was not my neuro's choice but my ability to self advocate won the day. I'm grateful for this blog for that reason.